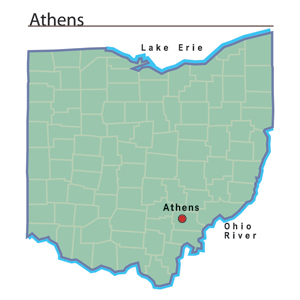 Difference between revisions of "Athens, Ohio"
Despite Ohio University's presence, Athens grew relatively slowly. It became the county seat in 1805. As late as 1840, the community had only 710 residents. The town had three churches and eleven stores to meet the residents' needs. Over the next forty years, Athens' population increased to 2,457 residents. In 1880, Athens was thriving town with six churches, three newspapers, and two banking institutions. During the twentieth century, Athens continued to grow and reached a population of 21,300 people in 2000. Ohio University, with an enrollment of more than twenty-eight thousand students and 276 different undergraduate degree programs, was the city's largest employer in 2002.